We have had many requests for transparent containers. In order to keep the negative effect of light on food freshness to a minimum, different designs have been considered. In the end we opted for containers with a small transparent window. It is big enough to see the contents of the container, but small enough to prevent light from affecting the color and nutrition of its contents. All the food compartments are made from BPA- and BPS-free plastic. Yes, to prevent the seal from deteriorating the Vacuvita Home Base will have an extremely durable rubber seal strip. The Vacuvita Home Base is designed to be used in specific territories and will be delivered as a one of a kind model. All clients will receive adapters suitable for their country or instructions on how to choose an adapter that would be most suited for use with the Home Base. Our small container has a volume of 1L(1.06 quart), medium – 2L(2.11 quart), large – 4L(1.06 gallon). Please consult our products page for more detailed information. The containers fit in the dishwasher perfectly and are dishwasher-safe. This is also true for the vacuum hose. 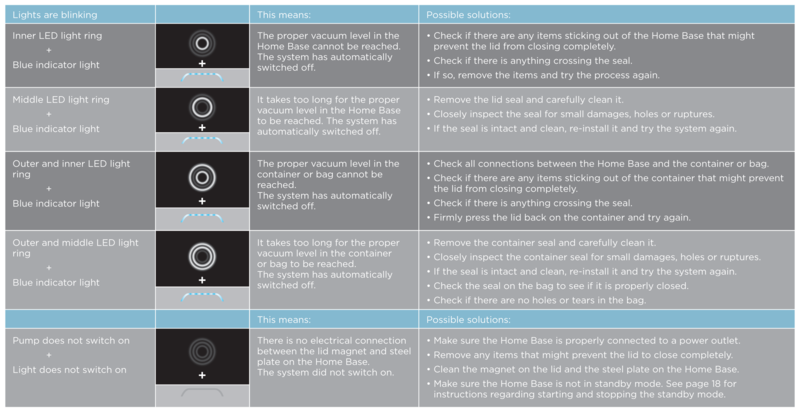 The Vacuvita Home Base itself contains electrical parts and therefore is not dishwasher-safe. We recommend cleaning the Vacuvita with a soft cloth and some non-aggressive soap.